Try a new spin on the "rocking horse" with this fun and brown horse! The perfect unity of classic and comfortable! 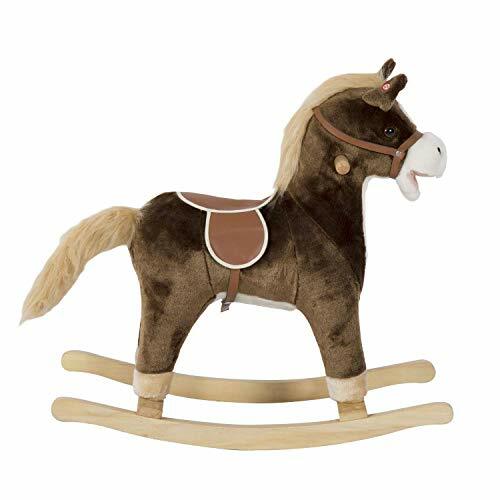 With this cute rocking horse, you can have a unique plush character along with a comfortable saddle position for your child to have fun in. They can go for a ride using their ride on toy and they wander in a part of your backyard they have never been before,?their curiosity automatically sets in. This forms the foundation for logical reasoning and critical thinking later in life. Kid got years of use from a rocking horse and it certainly benefited their little sensory system! Rockers can help kid improve their mobility, inspire independent & group play, and gain confidence from social communication with others. It is also a good method to put babies outdoor and distract from screens. What a great way to bridge the generations between you and your child with a toy that you remember from your childhood! Linzy Plush Dinosaur Rocker Collection with Nursery Rhymes Sound Rocking Animal, Green, 24"